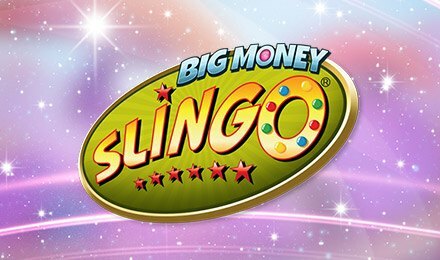 Play Big Money Slingo: A Slingo Game with a £150k Jackpot! Big Money Slingo is very different from the regular Slingo games. The game has a medieval theme, which shows a castle with a watchtower in the background. There is a knight guarding the tower, where it is rumoured that the Jester lives. Unlike other games of Slingo, this game begins with you having to choose a location to play at. There are 6 of them – Golden Fields, Diamond Peak, Royal Forest, Joker’s Hamlet, Lucky Gulch and Smugglers Cove. Each of these location carries a certain bet amount. So, when you choose the location, you automatically also choose your bet. The layout of the game is also very different from other Slingo online games. When you finish your Slingo login and enter the room, you see a 5x5 bingo grid under which a slot reel is placed. However, the pay table doesn’t exist. Instead there is an indicator against each row, column, and diagonal, telling you exactly how much you will win if you get a Slingo. Another unique aspect of this game is that when the game starts, the entire bingo grid is covered with stars. It is only as the reel spins that numbers on the board are revealed. Before you start the game, you need to select a location, which basically means you need to decide the amount you wish to bet. The minimum bet is for 50p, while the maximum bet is for £10 in real money. Then you click on the SPIN button. You get a total of 6 spins per game in which to win a Slingo. If you are lucky, you may even get up to 3 free spins to help you either boost your wins or complete the game. You win the game when you are able to cross all the numbers in a row, column or diagonal. The big win is when you manage to cross out the entire grid and achieve a Full House (which is the jackpot). If you choose to play in the Lucky Gulch – which is basically the £10 bet – and you get a Full House, you will win £150,000! There are only two special symbols in Big Money Slingo – the Jester and the Free Spin symbol. The Jester: The Jester is the wild in the game and how he appears is also unique. In other versions of Slingo, the wild appears on the reel and you get to choose which number you wish to cross out. However, in Big Money Slingo, the Jester appears directly on the grid before the game begins. His appearance is random and so you never know where he will land on the bingo grid. Free Spin Symbol: The other special symbol is the Free Spin symbol that appears on the reel during gameplay. These free spins are used only after you finish with the original 6 spins allotted to you at the beginning of the game. This top rated Slingo game does not really have any bonus rounds. What it does have is free spins. You can win up to 3 free spins during the game. If you win them all, you get a total of 9 spins to win the game and walk away with a possible jackpot of £150k. However, getting that jackpot is quite a challenge. The game has an RTP of 85.15%, which means that getting the big wins can be quite a task. The good part is that you can still get a steady stream of Slingos that allow you to make money. Here's where the big money comes into play. Get up to 4 joker matches right when you start!